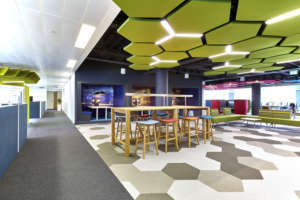 DXC Technology wanted a unique office in a 38,000 sq ft warehouse for its Scottish HQ and given our expertise with tricky Cat A and Cat B conversions, we were the perfect partner for the job! 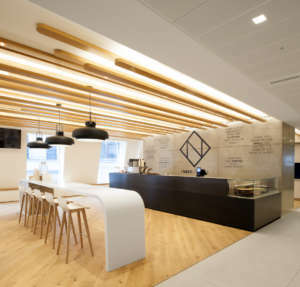 It’s no surprise that this incredible new space was shortlisted for a British Council for Offices award - it certainly gets our vote. Businesses grow and evolve over time but often their offices don’t. 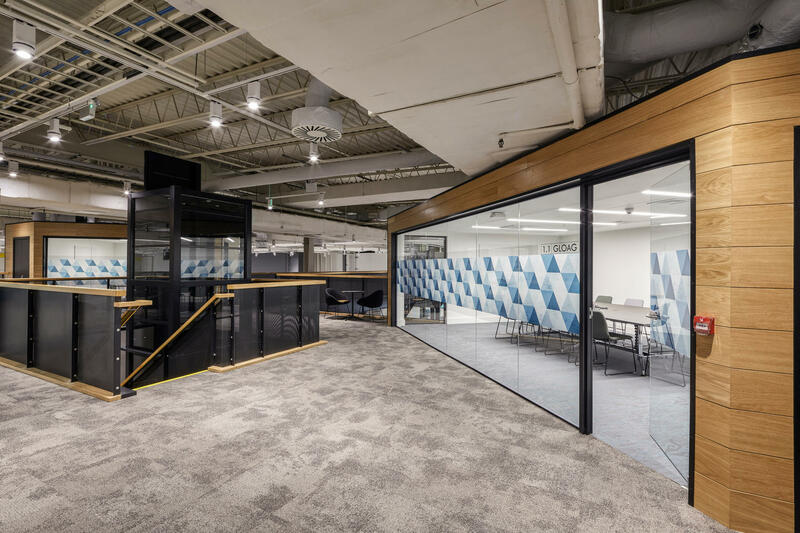 DXC Technology (formerly Hewlett Packard Enterprise) didn’t want to get left behind when it expanded its team and needed a bigger space. 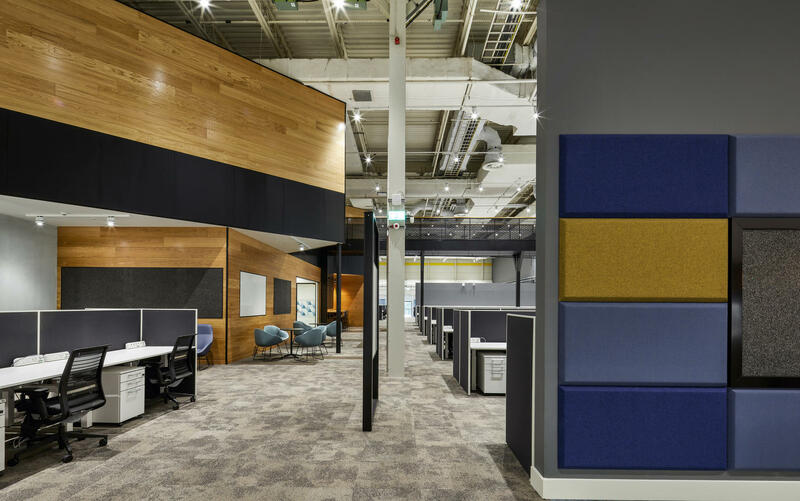 Instead of squeezing desks into its existing space, DXC wanted a jaw-dropping warehouse conversion with an industrial feel and plenty of room to accommodate its expansion. 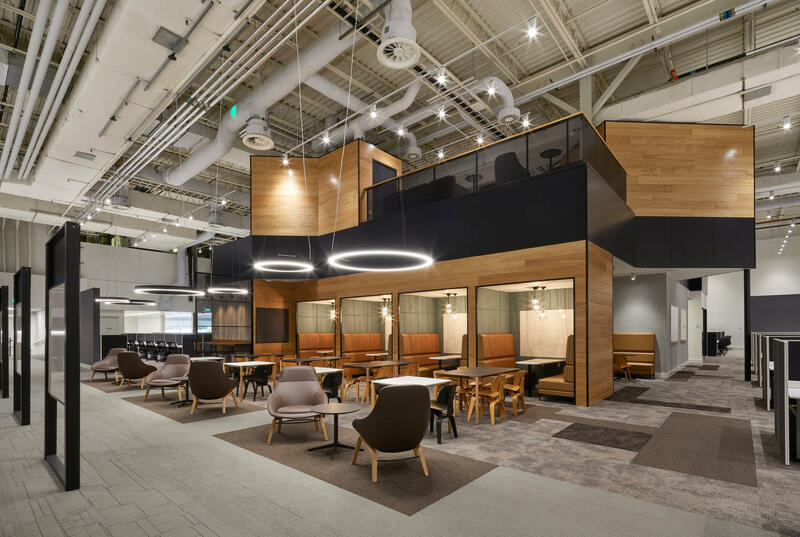 We partnered with IA Interior Architects, Aecom (mechanical and electrical) and Bruce Shaw Partnership (quantity surveyor) to incorporate a cantilevered mezzanine level in the large space that has classic warehouse proportions. 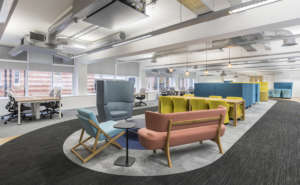 This cleverly added the extra space DXC needed for its 460 employees and freed up existing areas in the office to be repurposed into much needed communal facilities. This project included some sizeable construction elements. Erecting the cantilevered mezzanine level needed expert internal piling and steelwork to ensure structural integrity - but the work didn’t end there. 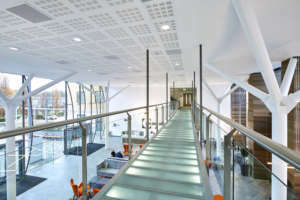 We installed a feature staircase, bridge and lift, and then created informal working areas and meeting suites. Washrooms and parking are often overlooked when accommodating more employees in a refurbished space. We built new toilets, drainage and a 240-space car park to make sure the building is now appropriately equipped for 460 people. During construction, noise had to be kept to an absolute minimum - even while cutting large concrete slabs for foundation pads – and dust had to be managed to protect critical business equipment. Underpinned by some fabulous exposed ductwork and ventilation fittings, the industrial look and feel of the warehouse was given a professional and polished makeover. The pipework had be modified and tided up before it became the feature it is today. 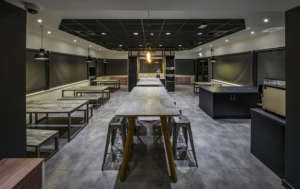 New flooring, bespoke timber cladding, furniture and décor all added to the final look of the space. But, it’s not just about looking good - the huge warehouse also needed some extra attention when it came to acoustics. 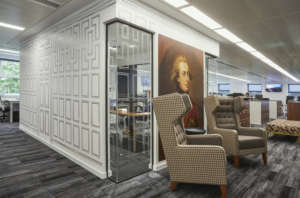 Wood panelling and special fabric partitions were used throughout to absorb, deflect and manage noise levels, especially in open plan areas. Implementing an activity-based working environment means incorporating a variety of settings to support different tasks - from collaboration to concentration, and everything in between. 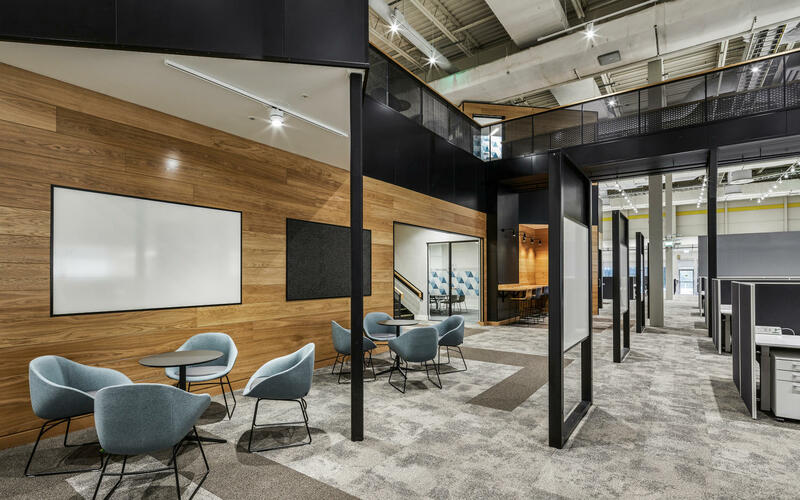 We helped DXC give its employees the freedom to work anywhere by providing different furniture options and integrated IT throughout the office. With remote access to the secure network, and USB and power points aplenty, employees can now work just as easily as they would at their ‘regular’ desk. 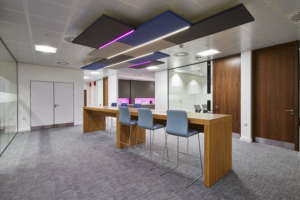 There are also dedicated meeting rooms with an integrated booking system and more informal areas (finished with armchairs and whiteboards) for impromptu get-togethers to encourage collaboration. We all know how tiresome it can be working at a desk all day and how important it is to take regular breaks. 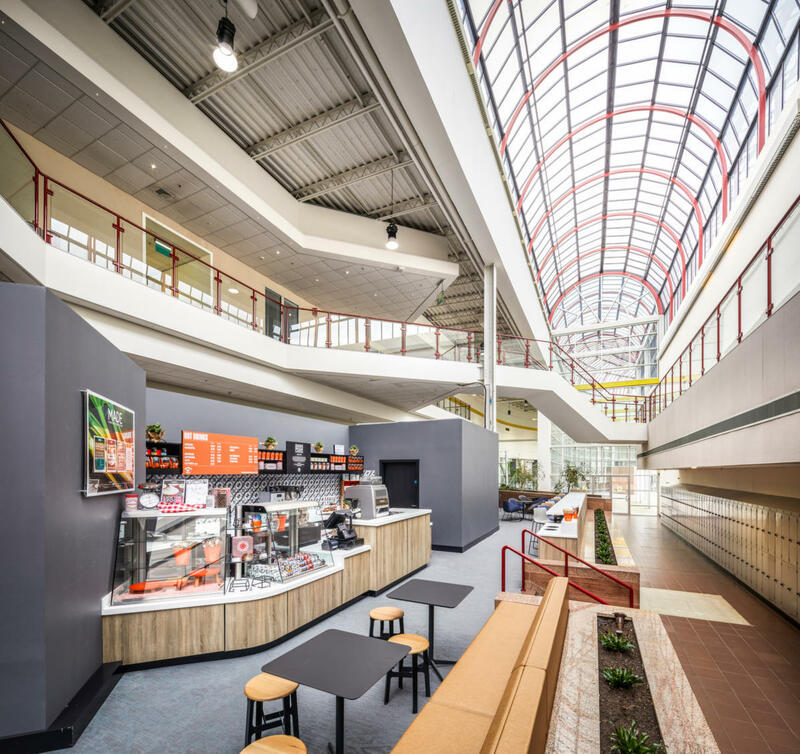 With a bigger team, DXC needed a new café and kitchen to make sure employees had somewhere to unwind and grab a meal. 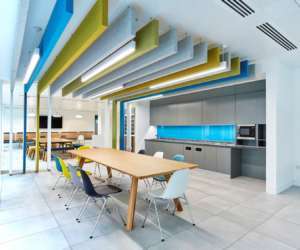 Taking advantage of the office’s stunning ‘suntrap’, we transformed an existing staff area into a lunch spot complete with dining booths, plants and a television.